Phone searches conducted by Customs and Border Protection (CBP) drastically increased last year, the agency announced on Friday, with agents conducting 30,2000 searches of phones and other devices during the 2017 fiscal year—a 58.5 percent increase from the prior year. More than 80 percent of the devices searched belonged to foreigners or US permanent residents, the Wall Street Journal reported. In addition to the number of individual device searches, the number of inbound international travelers whose devices CBP searched also increased, jumping to 0.007 percent from 0.005 percent in 2016. 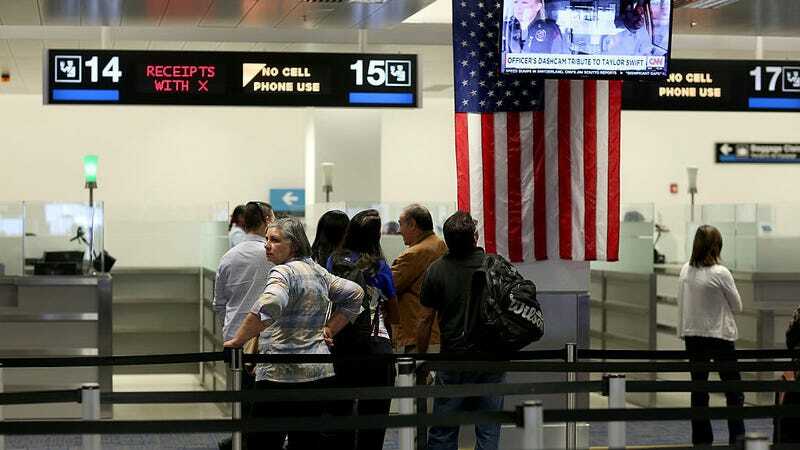 Last year, a group of 10 citizens and one permanent resident sued CBP, the Department of Homeland Security, and Immigration and Customs Enforcement, alleging that border searches of their devices had violated their First and Fourth Amendment rights. The group includes a NASA engineer whose phone search in February 2017 was widely publicized and is represented by the American Civil Liberties Union and the Electronic Frontier Foundation. CBP is also rolling out new policy governing border searches of phones and other devices. The policy says that agents can search a device but not cloud accounts linked to it and that they may ask for passwords to access a device but may not save them for later use. Warrantless searches of a person’s phone during an arrest are unconstitutional, the US Supreme Court ruled in 2014. However, border searches do not require a warrant, and CBP gets to set its own rules for how searches should be conducted.